The incredible rising stars on the dream pop indie rock scene – Slowdive are coming to do what they do best LIVE at The Wiltern on Sunday 29th October 2017! Get ready to see what they bring to the stage, with their captivating performance, these are definitely ones to watch! Book your tickets and be part of the crowd, something special, here at your local venue… catch them on their North America tour this Fall! 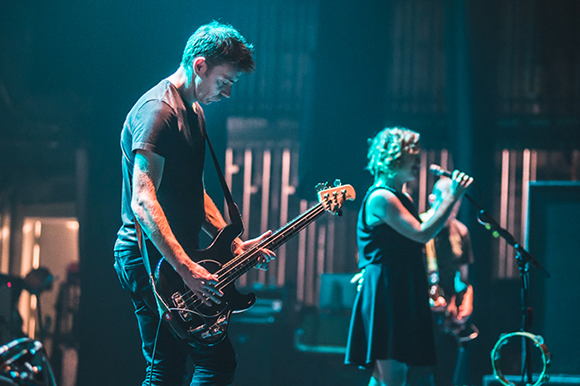 The English rockers, originally from Reading, UK – Slowdive are quickly creeping up on the scale on the live music scene, with their atmospheric shows, it's no wonder their music is spreading far and wide across the US and globally right now. These guys are; Rachel Goswell on vocals and guitar, Simon Scott on drums, Neil Halstead on vocals and guitar, Nick Chaplin on bass and Christian Savill on guitar. Several other drummers also briefly played with the band, including Adrian Sell, Neil Carter and Ian McCutcheon. Halstead is the band's main songwriter. With their beginnings of the band, Goswell and Halstead have been friends since early childhood and it really shows when they are on stage, another important aspect a long with music, it's the way that they interact with the crowd and with each other. Get ready to see what everybody's talking about as they take to The Wiltern this October, if you love ambient rock, this one's especially for you!